This is the heavily anticipated first post about schleuderball. Since I’m pretty sure that there won’t be anybody (except for a select few people that I know) reading this that will have any idea what schleuderball is, this post will simply be a brief explanation of the game. I will include some pictures and a video, to help me out with showing you how this works. 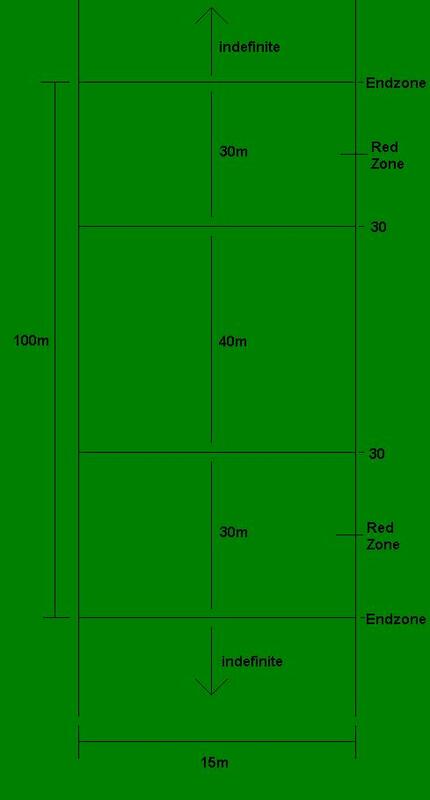 I will start with explaining the dimensions and layout of the field that the sport of schleuderball is played on as well as a description of the ball itself. The ball is made of leather and it weighs 1.5 kilograms (or about 3.3 pounds) most commonly filled with cork, similar to that which a baseball is filled with. 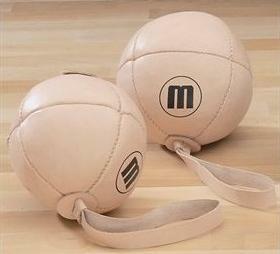 Attached to the ball is a leather strap, there is a picture of two schleuderballs above, on the right side of the page. The field is 100 meters long and 15 meters wide, and is broken into three sections. Two thirty-meter sections on the ends with a 40 meter section in the middle. At the ends of the 100 meters there are end zones that extend indefinitely. So the way that the field looks is demonstrated by the picture below, it’s not exactly in proportion to itself, but you should get the idea. The game can be played with up to 8 people on each team. Though similar to basketball, football and other sports you can play pick-up games with less than the total of 16 people, such as 2-on-2, 3-on-3 and so on. The object of the game is to get the ball to land in the opponents end zone. The game starts with each team standing at their own 30. The team starting with the ball throws (schleuders) the ball from their 30, and the other team tries to stop the ball as soon as they can. As soon as the ball’s momentum is stopped, it is the second teams turn to throw. They then schleuder from the the new line of schleuder, which is where the balls momentum was stopped. Then this process continues to repeat itself. Each team has a throwing order, similar to a batting order in baseball, determining which player’s turn it is to schleuder when it’s his or her team’s turn to schleuder. Now it gets really interesting when a player catches the ball. If Team A schleuders the ball and a player from Team B catches it then the player that caught the ball then gets to shock the ball. A shock is when a player throws the ball without using the strap. After the shock, it is still Team B’s turn to schleuder from where the shock was stopped. So essentially if a player catches a ball then that team gets two throws, the first being the shock by whoever caught the ball and the second being the schleuder where normal throwing order resumes. A shock itself can be caught and in term shocked back, but only three shocks can occur per schleuder, though this is a rare occurrence. I must say, the video was interesting. Since I don’t understand German, that was a bit of a struggle but the viewing seemed to confuse me enough. I don’t know that english would have helped actually. Thanks for the post. You guys are always interesting. This is a nice post. I had wondered how the game was played and how the field is configured. I played this game in 2002 at KU! If I remember correctly, Scott Seeger was one of my German instructors, and he taught a couple classmates how to play. We played at KU and then also when we were in Germany. Do you know where you can purchase a schleuderball? Gretchen, thanks for the comment! And yes, Scott Seeger is a great guy and is the one who brought schleuderball from Germany to America… as for purchasing a schleuderball itself, you can only get them in Germany. There are some companies that are willing to ship them over to the states but the costs are rather expensive but checking on ebay is probably your best bet. Hi. I’m trying to get a hold of Scott Seeger. He and I lived in Germany together back in ’88. If anyone here knows how to get a hold of him, I would appreciate the info. So, actually I found a nice German Company that was willing to ship here and has a pretty good selection of schleuderballs. Bonus: They both speak english. Reasonable prices.. I encourage you to contact one of them. They will E-mail you a brochure, in english! Spread it around! They are SUPER helpful!! Do you know where a schleuder ball can be purchased? My son and his high school friends like playing it. However, no one can figure out where to get a ball, as the one they were playing with is torn. You have to order them from Germany… Out of curiosity, where does your son play?